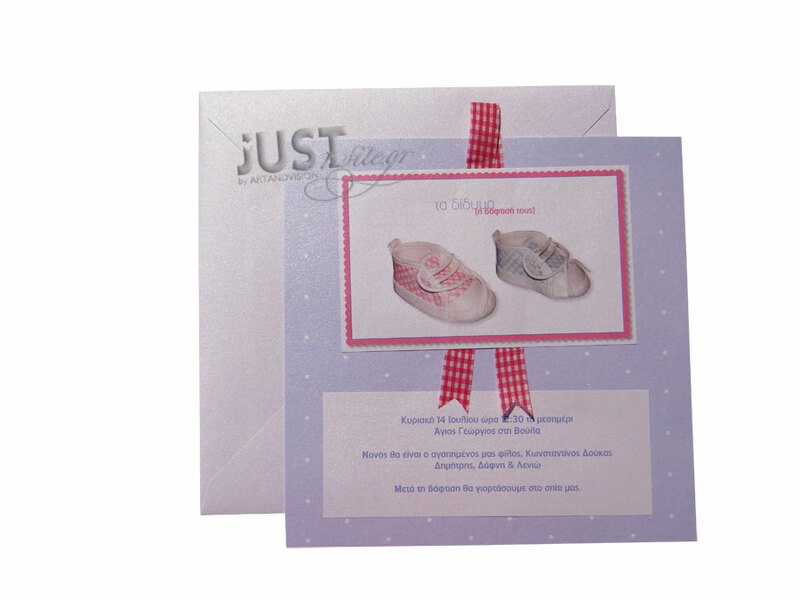 Greek Christening invitations for twins with cute baby shoes coming with a baby blue board with white dolka pots and a fuchsia lined window revealing a baby-shoes pattern in checked baby blue and white colour. The design is finished with a fuchsia checked ribbon colour and the matching envelope is white, classic square paper. Your personalised wording is printed in baby blue colour. Size: 21 x 21 cm. https://www.preciousandpretty.com/2017/04/greek-baptism-invitations-for-twins-baby-shoes-C1018.html Greek Wedding Favors|Orthodox Crowns|Stefana|Baptism Invitations Greek Baptism invitations for twins baby shoes C1018 Twins invitations with baby shoes for Greek Baptism Product #: Greek Wedding Favors|Orthodox Crowns|Stefana|Baptism Invitations_1455246029585595936 5 stars out of 5 reviews.